Medical Solutions is hosting a contest on Instagram. Post a pic of yourself in your favorite scrubs and you could win one of four $100 gift cards to Scrubadoo. Take a picture of yourself wearing your favorite scrubs and post it to your Instagram account with the hashtags #medicalsolutions and #showusyourscrubs. 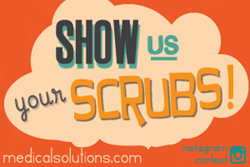 Medical Solutions kicks off its “Show Us Your Scrubs” Instagram Contest today. It’s super easy to enter — just strike a pose in your scrubs, snap a pic, and you could win one of four $100 gift cards to Scrubadoo.com. Take a picture of yourself wearing your favorite scrubs and post it to your Instagram account with the hashtags #medicalsolutions and #showusyourscrubs. That’s it! Now just sit back, watch your pic pop up on the Medical Solutions Instagram feed, and wait to see if you won. What are you waiting for? Scrub in, grab your camera, and enter any time now through September 9, 2013 at 12:01 a.m. CST. Visit MedicalSolutions.com/ShowYourScrubs for more details and follow us at Instagram.com/MedicalSolutions to get in on the fun. Don’t have an Instagram account? You can still enter by sending your picture to jeannie.holmes(at)medicalsolutions(dot)com. ABOUT MEDICAL SOLUTIONS: Medical Solutions L.L.C. became the nation’s third-largest travel nurse staffing company with its acquisition of OA Nurse Travel in 2013. Medical Solutions was one of the first Travel Nursing and Allied Healthcare staffing companies to be certified by the Joint Commission and has been continuously certified since 2004. Its focus is on meeting the urgent and short-term staffing needs of its clients with highly skilled Allied Health professionals, nurses and technologists. Medical Solutions was named one of the top three staffing firms to work for in Staffing Industry Analysts’ 2013 “Best Staffing Firms to Work For,” and has also been named six times to the Inc. 5000 list of fastest-growing private companies. A nationwide network of travelers allows Medical Solutions to help its client hospitals continue to provide excellent patient care amidst a Nursing and Allied Health shortage. Medical Solutions has contracts with nearly 1,200 client hospitals nationwide and is one of the fastest-growing companies in the Travel Nursing and Allied Health industry. Visit http://www.MedicalSolutions.com to learn more.